Here is QT-ESL SELF-TEST 4 for you to test yourself on podcasts 16 to 20. This audio file enables you to evaluate your progress in spoken English. 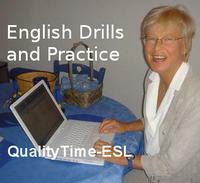 This test can also be used in EFL/ESL/EFL courses and programs. QT-ESL 20.1 "Self-Test 4 Part 1"
QT-ESL 20.2 "Self-Test 4 Part 2"